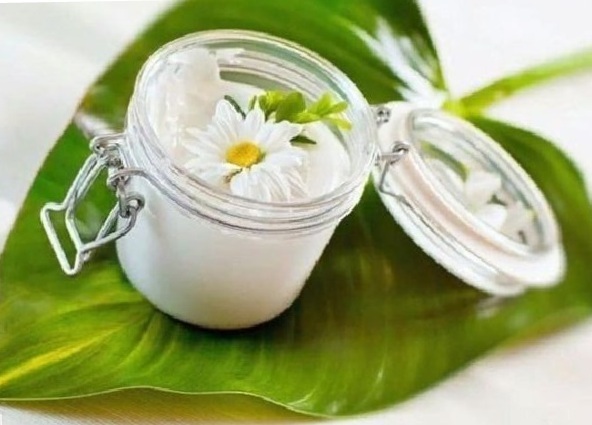 Today we ourselves will prepare an incredibly rejuvenating face cream at home. Already on the first day you will see how the skin of the face has refreshed and looked younger. Enjoy the result. Take a small closing jar with a lid. It is possible from under baby food. 1) Butter, lightly melted to softness — 1 teaspoon. 2) Ryzhikovoe or linseed oil — 1 teaspoon. 3) Vitamin E — 6 drops. It is necessary to buy in a pharmacy vitamin E in a solution of oil in a vial, and not in capsules. 4) Vitamin A — 6 drops. Also sold in a pharmacy, in a vial of a solution of vitamin A in the oil. 5) Lemon essential oil — 20 drops. Sold in a pharmacy, but you can squeeze 3 drops of juice from a lemon. Mix all the ingredients and apply on clean skin of the face and hands. Do not forget about the wrinkles around the eyes. Close the jar lid and put in the fridge. This amount of cream is enough for 3 days. Then cook again, the benefit of the time it takes 3 minutes. But the cream will always be fresh and healing. And what flavor gives the lemon essential oil cream! And gives vigor. You will see the result of this incredibly rejuvenating cream on the first day. Nasolabial folds will be smoothed out. Folds around the chin, which prevent us from concealing our age, will be smoothed out. Why is incredibly rejuvenating face cream at home so effective? What is useful for face butter? Butter makes skin of the face soft and supple. This is due to the composition of the oil. Butter contains fatty acids. Including the essential — Omega-6, Omega-3; fat-soluble and water-soluble vitamins (A, D, E; K); phosphates. Contains minerals — iodine, selenium, zinc, manganese. Butter need to take a natural, cream. What is useful for a person flaxseed oil. Flaxseed oil has the optimal ratio of essential fatty acids Omega-3 and Omega-6. Flaxseed oil will relieve the skin from cracks, bruising, lichen, soften and rejuvenate the skin. What is useful for the skin of vitamin E, or alpha-tocopherol. Vitamin E is a good antioxidant. This miracle, its rejuvenating effect on all human organs is unsurpassed. Moisturizes the skin. Rejuvenates the skin. Brightens her. Treats sunburn. Stimulates the renewal of skin cells. Vitamin E as an antioxidant. Fights free radicals that provoke pigment spots. Reduces skin stretching, restores its elasticity. What is useful for skin vitamin A.
Vitamin A (another name is retinol palmitate). It gives skin health and radiance. Improves blood circulation. Removes inflammation, acne. Prevents premature aging because it is a strong antioxidant. Rejuvenates by stimulating cellular renewal. Evens tone and improves complexion. Improves skin protection from sun and wind. Restores the upper protective layer of the skin, called epithelium. Improves elasticity, moisturizes the skin. With enough vitamin A, the skin is radiant, toned and fresh. But the wrinkles, acne and dry skin indicate a lack of vitamin A. What is useful for the face of essential oil of lemon. Lemon essential oil refreshes and invigorates. Removes depression. Improves concentration. The complexion improves, brightens. Reduces freckles and age spots. Tones, smoothes the skin, whitens it. Heals cracks in the lips. We learned one recipe for face cream at home. Only one — but how rejuvenating! Preparing it is a matter of minutes. But rejuvenation from it occurs instantly. Be young and stunningly attractive!